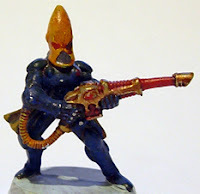 The gist of the post is that Ron felt the incredible amount of detail put into the new Dark Eldar models would lead to poor quality or unpainted Dark Eldar armies because people today don't have the time, patience or art degrees to do them nicely. One point Ron made was that you can't teach someone to have patience - and he's right. There's no tutorial one can follow and walk away with it - it just comes with time. This led to the question of how do we nurture a new artist so that they arrive at the point where they're creating things they're happy with, are testing their limits and haven't pulled all their hair out by the end? I've been teaching a friend of mine to paint recently. He plays swarm armies (Imperial, Tau, Orks) and is the sort of person who swore he'd never layer or blend and just wants to get his figures painted for the table. I pushed him a little to try some simple things (washing, dry brushing and playing with a few more colours) and after seeing what HE created by just adding a few easy steps, he's breaking out of his box a little and experimenting on his own. 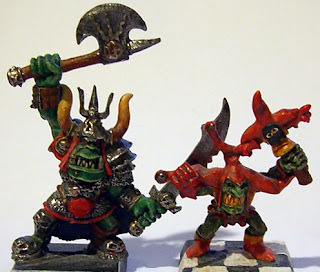 It helps that his switching to Orks was also inspired by his own interest in how cool he thought they looked and was genuinely interested in sprucing them up. When you're looking at detailed miniatures, it's very easy to be quickly blown away by what you're seeing. I remember as a kid looking at 'Eavy Metal books displaying incredible Golden Demon works and thinking "There is no way I'll ever be that good." This is slightly disheartening. Now, that's a big generalization because there are people out there who can learn fast and/or get really good at speed painting, and can juggle their personal lives with their gaming habits. But many of us started young and really any age you begin at, there's going to be all sorts of other life stuff you have to take care of. You'll learn at the speed you can, depending on the time you can devote to the hobby - that's the best you can do, so don't get frustrated. Even artists who walk away from Golden Demon competitions with the coveted Slayer Sword will often have table-top (or close) quality armies because it simply takes too long to create 30, 50 or hundreds of miniature masterpieces. So the new artist has seen examples of incredible art and wants to become just as good. They turn to the internet in search of tutorials that will show them how the pro's do it. Well, it doesn't really work like that. There's too much information available - not only does it get overwhelming for people just starting out, but as with anything, learning is a process and you can't start with advanced techniques right away. Many tutorials are hard for new artists to follow, no matter how much detail the tutorial gives. I don't expect people to replicate what they see on my Step by Step page - my hope is that they find ideas and inspiration as well as see practical examples of what you find on my Techniques page. Nothing you read will teach you to have a steady hand or to paint in the lines. Don't expect your early works to look like the photos from whatever tutorials you're following. The important thing is that you're practicing and learning. NOBODY is ever expected to be great at what they do when they first learn it. Don't be disheartened at any time that you are LEARNING. Like how your army looks after some colour and a wash? There's nothing wrong with that. Feel like taking a little more time to dry-brush on a highlight? Great. Don't want to spend 17 steps just to colour your terminator's armour? Your sanity thanks you. 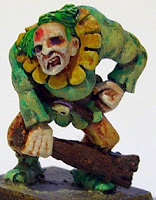 Spending as much time on a single limb as you used to on an entire model? Now you're headed in the right direction. It doesn't have to be a matter of incredibly hard techniques that take ages to pull off. One of the first steps to becoming a great painter is to learn the patience it takes to treat all the small details on a model equally. For example, recognize that an arm is more than just an arm and treat each section equally - it's a hand, jewelry, cuffs, cuff links, elbow pads, etc. This doesn't make your job any harder, it just takes longer. Choosing how much effort to put into a project is a choice to make, not a skill to learn. Your time investment will affect your final product. It's OK if you choose not to spend more than an hour on each model, just don't expect it to look like something you'd get from spending 10 hours on. Ron and I want to take some time to help new artists learn some basic painting skills that can create a foundation to be built on. We feel that if we show you some simple ways to create table-top quality miniatures, it will not only help new artists create their first armies but hopefully build confidence in their abilities that you can then expand on. Read his introduction and views on the project here. Every other Wednesday, starting this week, Ron and I are going to post a tutorial using basic techniques that should be easy to follow and reproduce. This'll be a 6 part series. The theme each post will be similar, that way you get a couple perspectives on creating a final product. We'll link to each others works during this series so you can see both progressions. I'll also be adding these to a "Back to Basics" section on my Step by Step page. We're going to start with a model based with White Primer, then one with Black, explaining the reasoning for each. From there we'll look at similar models; Sci-Fi, Cloth/Leather, Metallic Armour and finally muscles/hair/fur. 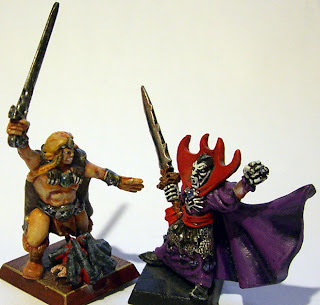 Each of these tutorials will use simple techniques, a limited number of steps and colours and display that it's not that hard to make decent quality miniatures. We'll also detail each step and explain our method throughout. Our hope is that you'll learn some ways to make painting easier and simpler while creating minis that look good and you're happy with. Maybe you'll even start taking the time to experiment for yourself and learn the patience it takes to take your models those extra steps. Also, because I haven't plugged it recently, I think all new artists should have a look at my Hobby Safety post so they can be aware of how to stay safe while having fun. Dave, congrats to you for taking on such an under-represented and much needed task. Thanks for gutting out something pretty huge and talking to Ron, who can has the ability and knowledge to help tons of painters out there. I adore your work and I have found you to be nothing less than generous and helpful- I wish you the best in this adventure, and I'm looking forward to it. I am not a great painter by any stretch, so I hope I can learn something too! edit: "Ron, who can AND has..."
I am looking forward to this from you both as well,and can I say I still have the Barbarian and the Vampire models somewhere myself! Good on ya! Look forward to your thoughts. Patience is definitely the big thing. Knowing your tolerances for "good enough" is important. One thing that I have been looking for, but never seen, is help with getting better at painting. I "know" how to dry brush, blend, etc. But how do I specifically practice certain techniques to get them down? 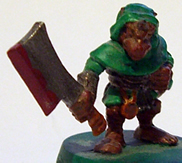 The "obvious" answer is, paint a lot of minis, but that is quite inefficient at least for me. I don't notice any real improvements in my painting and I am not going to start blend over a model I already spent hours on and repainting that area would take time (I paint a lot of yellow...), especially since I am far behind in my painting schedule. Thanks All, both Ron and I are really looking forward to seeing what this brings to the blogosphere and how it can help. Excerices would be interesting. I just don't have an art background so I haven't got much experience with it. Plus painting lines and circle on a piece of paper didn't sound right to me. I loved this post so much, It was a true inspiration for me , so much so that yours is the first post I ever felt compelled to share on twitter, it is that damn good. @Flekkzo: I can understand. I think you're saying it'd be one thing to learn what dry brushing is, and another to actually apply it. Stick around and hopefully this blog becomes a useful place for you. @Grum: Well then, I'm honored :) Thanks! @Dave I think a better example might be brush control. I should get better brush control by painting more, but how can I practice brush control so that I can step up and do things like freehand, better line highlighting, wet blending, etc. Oh, and if anyone is interested in a wash heavy style check out master darksol who has some quite nifty specific tutorials on his blog. Well, brush control and line highlighting still comes down to practice. I'd suggest picking up a bunch of cheap used models off Internet. Freehand is hard, at least for me. Not being trained in art, I actually paint on 2D surfaces terribly. I'd suggest research and reading to see how people / instructors do it. Might have to start with drawing. You can paint on white paper... could draw pictures then paint them in. That tutorial will work with normal paints if you hit up an art or hobby store (Michaels) and buy some fluid retarder or slow dry or blending medium. Liquitex is the brand I usually suggest.